For our Austin food blogger hatch chile potluck, I made a sourdough bread with roasted hatch chiles and roasted garlic in it. Luckily, the bread turned out fine, but since it was an experiment and I wouldn’t know if it seemed ok or not until the last minute, I also had a back-up plan. The back-up plan unraveled something like this: remember that asparagus lasagna I made back in March with the cream and parmigiano sauce? Yes, what if I made that with roasted hatch chiles and fresh corn instead of asparagus and then used Mexican cheeses instead of Italian ones? It sounded like an interesting flavor combination, but do you also remember what that lasagna looked like and can you imagine how it would look after being transported to a potluck and sitting out for a while? Right, so I started thinking of ways to combine those ingredients in another format, and that’s when I found the risotto balls recipe in Martha Stewart's Hors d'Oeuvres Handbook . 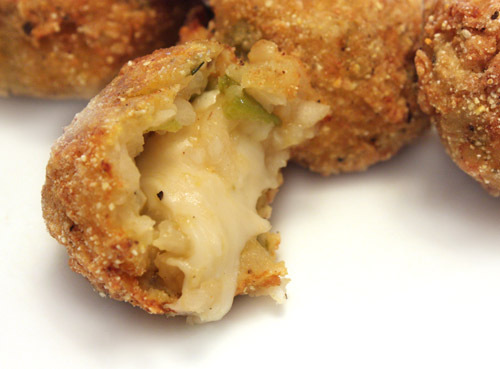 Fried arancini would travel much better than a lasagna with cream sauce. I made the risotto as suggested in the book, but at the end I added about seven hatch chiles that had been roasted, peeled of the charred outer layer, seeded, and chopped. I also added fresh corn kernels cut from two small ears of corn, and a couple tablespoons of chopped cilantro. Then, instead of using grated parmigiano, I grated a dry jack cheese and stirred it into the risotto. The finished risotto was left to cool and was then refrigerated overnight. There are a few steps to completing this hors d’oeuvre, but each of them can be spaced out and tackled when you’re ready. Once the risotto had completely chilled in the refrigerator, it was ready for forming into balls. For each, one tablespoon of risotto was formed into a cup shape into which a small cube of queso oaxaca was placed. Then, the risotto was gathered around the cheese cube and rolled into a ball. Once all the balls were formed and placed on a parchment-lined baking sheet, they were refrigerated overnight. Next, the risotto balls were breaded with flour, then egg, then cornmeal. At that point, they could have been refrigerated again until ready for frying. They were briefly fried for two minutes or so in a saucepan with a few inches of hot oil. The cornmeal made a nice crunchy surface which contrasted well with the oozing center. Sweet, fresh corn and smoky, roasted hatch chiles sidled up comfortably to the queso oaxaca. The flavor combination here was a good one, and I think the lasagna version will be just as good when I can serve it at home straight from the oven. 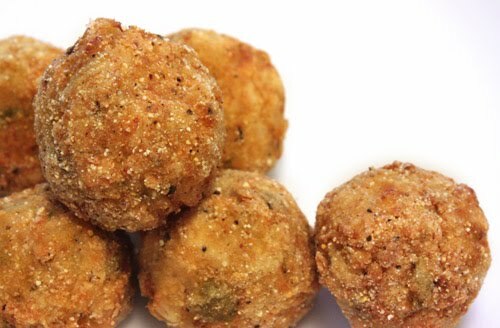 OMG I love risotto balls and those look so good Cripes! Oh wowza! Look at those! Would love some right now! How great would these be for a cocktail party!?!? Love this fusion Arancine. Delicious and beautiful. Wow, Lisa! Those look absolutely delicious and I totally love the flavor combination! I just knew you had to be Texan when I saw this on Tastespotting! Looks so delicious and cheesy. I love the heat from Hatch Chiles, the cheese and risotto and queso oaxaca make the perfect balance! Mmm...Risotto balls. Hand me a dozen of those and I'll be happy. I need to make me some risotto stat. It's been too long since I've had any. oh yum! this looks so good! I bet those were a hit! The crispy outside and gooey middle - I can't think of anything better right now! like spicy arancini rice balls! Beautiful! Wow, you did amazing things with the hatch chilies. Impressive! I would have been popping those risotto balls like bon-bons. They would have quickly disappeared. Wow, this sounds like a great southwestern twist on risotto balls. Yum! What wonderful balls! I love your choice of flavorings! This is just cruel and evidence of your insane genious. I adore a good risotto ball!! Yours look georgous!! Oh my. Please overnight these to us. I'll pay anything. Crazy that we posted these the same day... These look and sound amazing, love all the twists! This is something new to me, never made risotto balls before, sounds interesting! I've been looking for other uses for my Hatch chile. Thanks. Oh, wow, that is a fabulous recipe with hatch chiles! I really need to make these delicious risotto balls right away! wow! love the flavors used!! yumm!! those balls sound delish! Those look like little balls of heaven. Delicious, golden and crunchy. Love the cheese you chose :)! more hatch chillies!! 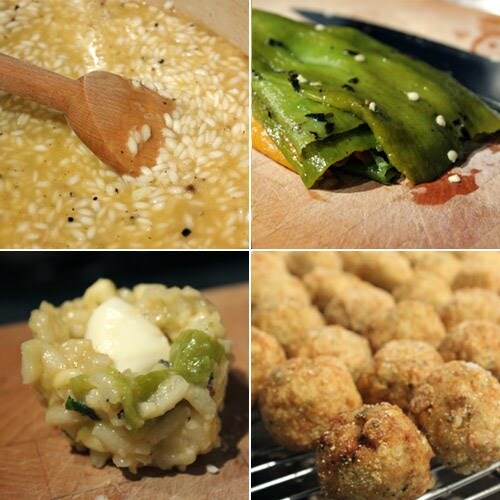 I have never tried making risotto balls, they looks so delicious & gooey inside. Not only do these look delicious, but it gives you an excuse to say, "hey, take your hands off my balls" LOL i kill me, sorry, I'm just tired :D... very tired. These are so tempting! I'm intrigued especially by the last photo. These sound so delicious! That last photo does look very tempting! Oooh look at that gorgeous oozing! That looks so tempting I want to reach into my monitor to touch it! The middle oozing bit is to die for! [Munch, munch, munch . . . ] Oh, that's just wishful thinking because I don't have any of these delicious risotto balls!! The last photo has sent me over the edge - these are just too good. Oh wow, these look amazing! I love that picture of the one you cut in half, it's making my mouth water! I love eating rice and just stumbled upon this awesome recipe! Thanks for posting this up!